Skippy 2.0 | Food E.
During the summers of my youth in lovely Rochester, NY few sounds brought greater joy to my little heart than the ringing bell of Skippy, the ice cream truck (was he called Skippy everywhere? Or is this another local word that I’m unaware of?). I remember begging for a dollar and then chasing that truck down the street, hoping for some sickly sweet frozen dessert that would promptly melt down my forearm because I ate so freaking slow. 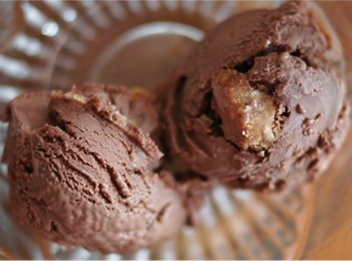 Nowadays, there is an easier and way chicer way to have ice cream delivered to you, and it’s called MilkMade. This brilliant company will deliver handmade ice cream to your door, once a month for three months at the low, low price of $50 (I know, it seems a little steep but with flavors like Coffee and Donuts made with Crop to Cup‘s Uganda Bugisu coffee and REAL Doughnut Plant donuts, I’d say: worth it). Their focus is on using products from local companies and creating stellar combinations of flavors you won’t find in the grocery store. If you’re outside their limited delivery area, you can also find them at the Greenpoint Food Market. The next market is May 22. See you there? That’s what I thought. Pingback: Braving the Rain « Food E.
I was the Skippy guy in Gates during the Summer of 1975. It was a great time during a great time. A great, great time. Begging for a dollar, racing down the block after the truck and then the whole thing melts in the heat after 2 minutes. Those are some of my favorite summer memories! I live in west irondequoit and skippy fly down my little street like its a highway!!!! !Not happy!!! He could kill someone!!!! My neighbors and I call him the phyco icecream man!